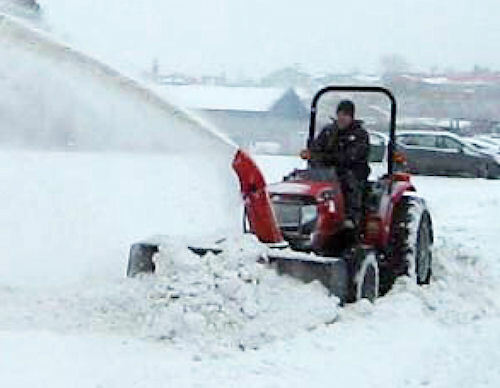 Easy-attach implement help keep Mahindra tractors busy in snowy weather. A new snow blower and blade is available from Mahindra for its 3016 and 3616 model tractors with dealers stocking them right after New Year's Day. The implement features a 72-inch heavy duty snow blade with 25-degree hydraulic angling and a trip spring. A reversible scraper bar and adjustable skid shoes made of abrasion-resistant Hardox 400 steel is designed for long life under tough conditions. The blade also comes with a quick release system and parking stand. The snow blower features an easily adjustable -- from the driver's seat-- hydraulic spout for snow projection is mounted on an anti-friction ring for easy rotation in a 237-degree arc. Mahindra is getting into "winter management" with its new snow blowers and blades for the Mahindra 3016 and 3616 models. For more information on Mahindra and its products, visit www.mahindrausa.